I just got home late on Saturday night from spending the previous week on a trip in Southern Utah and Northern Arizona. One of the main goals of this trip was to visit some new rock art panels and sites. On our drive south, the first location we stopped at was the Parowan Gap. 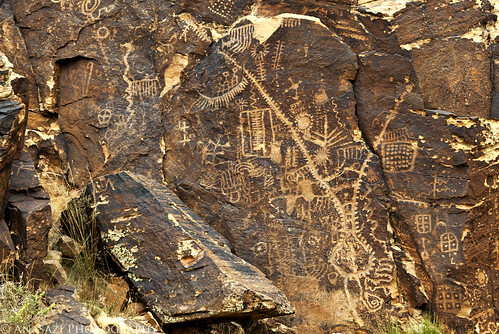 There are many petroglyphs located in this gap in the Red Hills west of the Parowan Valley, but the Zipper-Glyph is probably the most well-known. Some believe that the large zipper-like figure, that is the focus of this panel, represents some kind of map or calendar system….or both. The shape sure does resemble the Parowan Gap in which it is located. This was a great first site to visit on the week-long trip. I’ll be posting more from the trip in the upcoming weeks.